Changing climatic conditions are already affecting us and the projected impacts of climate change have the potential to seriously impact our environment, economy and society. Addressing this challenge requires systemic innovation on multiple fronts. Climate-KIC Australia’s Innovation Day at NCCARF explored the innovations already happening and what more is required in order to adapt to current and future climate change impacts. Over the course of the day, panellists explored a range of technological, policy and regulatory, and financial approaches to addressing climate change adaptation. Discussions included innovative uses of technology as communication and decision-making tools, how community ecosystems organize for innovation across stakeholders and sectors, and how innovations in finance can boost adaptation. The final afternoon session Climate-KIC collaborated with the Earth Science and Climate Change Hub (ESCC Hub) to lead a training session where participants were encouraged to ‘Catch a Cab’ and design a climate adaptation bond. Katie Vines from Climate-KIC Australia kicked off the Developing the Adaptation Innovation Community session by highlighting the importance of climate adaptation innovation, and how Climate- KIC Australia is supporting the development of an adaptation innovation community and ecosystem. The session showcased a range of innovative solutions that are already contributing to climate change adaptation in Australia; and shared insights on how innovation can support their adaptation. Dr Karl Mallon from XDI reflected on his experience of getting an adaptation start-up off the ground in Australia and how his businesses Climate Risk and XDI have needed to be tough, targeted and better than anyone else, in order to survive. He highlighted the importance of keeping intellectual property with the people who will make sure ideas have a life beyond individual projects. Professor Jon Barnett from the University of Melbourne proposed a need to appropriately balance the government and market economy, emphasizing that government intervention is needed for to ensure public good outcomes (like equity), while at the same time allowing for innovative solutions to flourish. Jon challenged the audience to consider the innovations that might already exist in the adaptation space and that it can sometime be controversial to talk about how possible adaptation is. The afternoon session Can Financial Innovation Boost Adaptation? provided a detailed update on the status and trends of adaptation financing, and emphasised it will be a critical aspect of a successful adaptation response. Kate Mackenzie from Climate-KIC Australia provided an overview of emerging and proposed adaptation financing tools, such as such as climate bonds, environmental impact bonds, new insurance schemes and the resilience bond program RE.bound. Rosemary Bisset from the National Australia Bank highlighted the importance of getting the risk and return balance right, finding ways for banks to access quality, credit worthy projects and making the most of existing financial products where suitable in order to get scale and speed to market. She also highlighted that new financial products and further financial innovation will require innovative partnerships to leverage government funding, minimise risk, build deployment capability and provide an enabling environment. Crystal Flemming from the Investor Group on Climate Change highlighted the research they had cerried out with NCCARF and James Cook University From Risk to Return: Investing in Climate Change Adaptation. She discussed some of the barriers to investing in climate change adaptation, such as difficulty identifying the revenue stream and commercial investment return. She also presented some potential solutions for increasing investment, including learning from mitigation finance approaches to develop project aggregation models and working with carbon finance agencies to develop investable measurement models for resilience outcomes. Alison George, Regnan the responsible investors’ perspectives on the state of adaptation finance, and revealed some of the barriers and potential pathways to adopting and advancing adaptation finance instruments. She also expressed a need for the finance industry to gain more domain knowledge and insights on climate change, so they can better understand potential risks to their investments and find opportunities to direct their resources. Jeremey Burke from the Impact Investor Group, Board member of CDP and former Director at UK Green Investment Bank shared valuable tactics to overcome current institutional limitations with new business models and policies. He suggested that some of the best opportunities for finance may be in blended finance – aggregating projects from both mitigation and adaptation. He made the case for embedding adaptation finance in existing financial systems to accelerate action and urged caution against creating a niche adaptation finance industry. The final session of the day was an innovation on many levels. 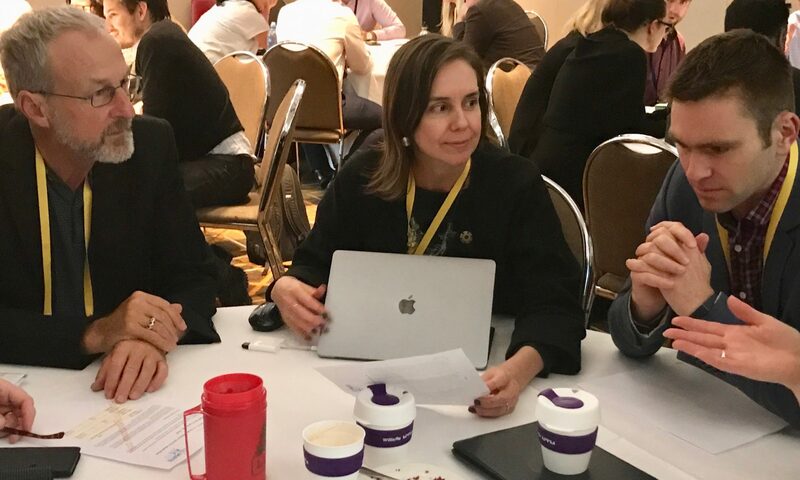 A session run jointly by Climate-KIC Australia and the ESCC Hub encouraged participants to improve their understanding of finance available for adaptation action by ‘building a climate adaptation bond’. The workshop explored the relationships and tested the limitations between the physical risks described by climate science and the financial instruments that can be used to fund climate adaptation. Participants were asked to design and issue a climate bond, and their decisions were tested against a possible future climate. Almost all the teams survived the future climate – perhaps due to the expertise on climate impacts and adaptation options they gained throughout the conference – and all the participants learnt a lot about finance. The sessions sparked such interest and discussion that it was hard to get people to leave the room.